The primal response to certain forms of creative communication remains intact in individuals with Alzheimer’s disease and related dementias, even when memory, language, and cognition are impaired. Creative arts therapies help make the most of these abilities. This phenomenon, in which emotion and memory are stirred in the absence of conscious thought, is at the core of how expressive therapists are helping individuals with Alzheimer’s disease and related dementias through various artistic modes, from painting and poetry to music and dance. While researchers are exploring the value of expressive therapies in treating those with cognitive deficits, most people have personal experiences that seem to prove the therapies’ indisputable benefits. We intuitively understand that music and movement tap into deep wells of memories because we know the feeling of being taken back in time by music or of being able, without thinking about it, to execute a movement not performed for years. Expressive therapy and emotional and imaginative power of the arts, even over people who seem to be unreachable, was the subject of a 2011 movie, The Music Never Stopped, based on “The Last Hippie,” an essay by famed neurologist Oliver Sacks, MD, in his book An Anthropologist on Mars. It tells the story of a young man stricken by amnesia as a result of a brain tumor. With the help of a music therapist and a devoted father, he was able to engage with others and retrieve memories in response to the music that had inspired him in his youth, particularly that of the Beatles and the Grateful Dead. Although intellect and cognition are involved in the creation of art and may enhance the understanding of works of art, to be appreciated at its most basic level, art relies equally, if not more heavily, on the senses. The primal response to certain forms of creative communication remains intact in individuals with Alzheimer’s disease and related dementias, even when memory, language, and cognition are impaired. Thus, expressive therapies can not only be especially useful with these individuals, they can also help providers focus on their clients’ abilities and what they retain rather than on their deficits and what they’ve lost. Expressive therapies and creative arts therapy are umbrella terms that encompass several disciplines: art, music, dance/movement, and drama therapies. Each of these modalities is practiced at CJE SeniorLife, an organization based in Chicago that provides skilled nursing care, memory care, assisted living, and adult day services. “Art therapy can range from insight-based support groups for those with early-stage dementia or mild cognitive impairment to nonverbal, sensory-based interventions for those in advanced stages of dementia,” explains Theresa Dewey, MAAT, ATR, LPC, an art therapist who works at the Lieberman Center for Health & Rehabilitation in Skokie, Illinois, CJE SeniorLife’s skilled nursing facility. Experts say it’s important to note that the outcome of expressive therapies for individuals with Alzheimer’s and related dementias isn’t necessarily improved memory or cognition. “The goal in treating anyone who has a medical condition that does not lend itself to cure or rehabilitation should be personal comfort and maximizing remaining abilities. All interventions should be focused on enhancing the quality of one’s life,” says Daniel Kuhn, LCSW, community educator and project manager at Rainbow Hospice and Palliative Care in Mount Prospect, Illinois. “Even when someone is not responsive to music, a dance/movement therapist can continue to reach that person through movement and nonverbal communication,” Newman-Bluestein says. “Dance in particular often taps into muscle memory and may even evoke reminiscences of joyous occasions in the past,” adds Andrea Koch, MA, ATR, LPC, manager of life enrichment and creative arts therapy at the Lieberman Center. Ultimately, “The modality that is best for a client is the one they respond to,” says Erica Hornthal, MA, BC-DMT, LCPC, owner and president of North Shore Dance Therapy, a psychotherapy practice in Chicago dedicated to helping individuals and families cope with the challenges of dementia through body-mind interventions. Koch points to the potential of expressive therapies to bypass deficits and highlight abilities. “As those of us who work in dementia care well know, clients often find creative ways to adapt to their physical and cognitive limitations. Indeed, where memory falls short, creativity steps in,” she explains. “For people who have dementia, verbal communication and expression can become challenging,” says Gail Adduci Gogliotti, MA, BC-DMT, LCPC, a dance/movement therapist at Norwood Crossing, a nonprofit senior assisted living and skilled nursing community in Chicago. 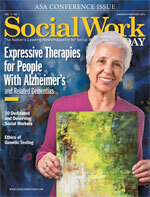 She says expressive therapies—and dance/movement therapy in particular—provide an outlet to be expressive nonverbally. “By engaging them to be present in the moment in this way, you can truly meet the clients where they are. There isn’t any pressure to say or do the right thing or to remember what you had for breakfast or where you grew up,” she explains. Difficulty communicating can lead to isolation, she says, so movement therapy, through bypassing verbal communication, also helps those with dementia interact with others. But neither previous knowledge of how to dance nor full mobility is required for such therapy. “The most primitive movement we have is breathing, and we can all breathe, even someone on a ventilator,” Hornthal says, and as long as someone can breathe, he or she can engage in dance therapy. Similarly, anyone whose hearing is intact can listen to music, and many individuals with dementia also can sing or create sound. Further, expressive therapies aren’t arts and crafts classes, Koch notes. The point is not to produce aesthetically pleasing products. “The processes we employ, while often fun, are clinically oriented and aimed at helping clients reach specific goals,” he explains. Koch often recommends Anne Basting’s book Forget Memory to clinicians who want to explore the use of expressive therapies. “Basting points out that if we ask clients to recall specific facts and events, we are setting them up to fail. If we find ways to creatively engage with them in the here and now, it levels the playing field,” he explains.